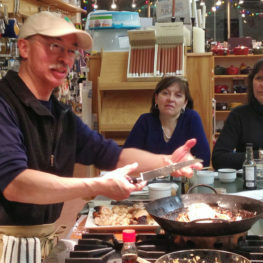 Chris Toy's Asian Holiday Dinner Workshop! Join SAFA and Stonewall Kitchen cooking instructor Chris Toy and help him recreate a favorite holiday meal enjoyed by his family for generations. You’ll learn how to make Wok baked Chinese chicken, fresh wonton dumpling soup, crispy vegetable spring rolls with homemade duck sauce and killer hot Chinese mustard. Fresh Vegetable stir fry served over smoky steamed jasmine rice followed by amaretto creme with mandarin oranges for dessert. Thursday, November 29 from 3-7 pm at the Waldron House.